The long-term sustainability and success of our business is achieved through the adoption of appropriate Economic, Environment, Social and Governance (“EESG”) practices and we are committed to formulating policies and embracing practices that manage these issues responsibly. Five Sustainability Reports have been published since 2013, each detailing our management approach, targets, executed initiatives, achievements and challenges. We are pleased to issue our inaugural Integrated Sustainability Report for FY17/18 that adopts elements under the International Integrated Reporting Council’s (IIRC) Integrated Reporting Framework. It builds upon our business model and six input capitals introduced in FY16/17. The report includes details on our governance and leadership, how we manage our risks and opportunities, and outcome of our business activities that is linked to the capitals. This report is prepared in accordance with SGX-ST Listing Manual Rule 711(B), and the Global Reporting Initiatives (“GRI”) Standards – “Core”, along with GRI’s Real Estate Sector Supplement (“CRESS”). In framing this FY17/18 report, a new materiality survey was conducted to derive key EESG issues, with considerations given to the current business environment, business objectives and feedback from internal and external stakeholders. Nine material factors were identified in the process, including new topics on “Embracing Innovation and Technology” and “Adaptability to Market Changes in the Countries that Ascendas Reit Operates in”. (Please refer to page 8 for details on our materiality assessment). In line with Ascendas Reit’s commitment towards sustainability, we have aligned our efforts with the 2030 Agenda for Sustainable Development, which has been adopted by the 193 member states of the United Nations in 2015. This year’s Integrated Sustainability Report will elaborate on the initiatives taken as well as how we support and contribute to the achievement of eight Sustainable Development Goals (SDGs) that are relevant to Ascendas Reit, out of the 17 goals under the 2030 Agenda. In FY17/18, sustainability risk has been identified and included as one of the key risk that would have a significant impact on Ascendas Reit’s operational excellence and business continuity. The Manager will report to the Audit Committee and the Board on any material EESG findings and recommend mitigation measures on the management of such risks. (Please refer to pages 118 to 122 of our Annual Report FY17/18 for details on our Risk Management Process and key risks that were identified). We are a firm believer in responsible consumption of energy and water resources through optimal efficiency in our operations. In Singapore, we have reduced our energy and water consumption at our operational properties, on a like-for-like basis, from 101 million kWh to 97 million kWh and 1,300 thousand m3 to 1,212 thousand m3, respectively. Our energy and water resource conservation efforts are coupled with the adoption of green technologies, as we continue to explore and introduce higher efficiency systems and components for our buildings. 2.5% of the annual total building energy consumption at Nexus @one-north was replaced with energy generated by its solar photovoltaic system, while its chiller plant system operates at high efficiency. We are proud to share that the building was recognised as the top winner under the Green Building (Large) Category at the ASEAN Energy Awards 2017. In order to stay relevant in today’s competitive environment, innovative product offerings have been launched. CoSpacePark and The Workshop were unveiled during the financial year, to meet the demands of a new generation of customers in today’s shared economy. Operations have been complemented with innovative solutions such as an autonomous booking and payment system, mobile booking application and mobile security monitoring. Another initiative introduced during FY17/18 was the Ascendas-Singbridge Operations Centre, which remotely monitors real-time on-the-ground operating parameters at our multi-tenant properties, including security, car park systems, mechanical and electrical equipment. This innovative, resource-efficient solution involving the deployment of remote intelligent sensors will be rolled out in phases. It has reduced our response time to operational disruptions and facilitated improved service delivery to our customers. The hard work and dedication of our employees are key contributors to the long-term success of our business, and we are committed to ensuring their well-being and engagement. We continue to leverage on employee engagement touch-points including corporate events, town halls and employee forums, to strengthen our shared corporate values and camaraderie. Flexible work arrangements were introduced in FY17/18 to support work-life integration and promote a pro-family environment. With these new initiatives, we aim to create and sustain a highly productive and performance-driven culture of excellence. We are committed to identifying, managing and monitoring material EESG matters, to help build a long-term sustainable future for all our stakeholders. After publishing five sustainability reports, this is the first year that Ascendas Real Estate Investment Trust (Ascendas Reit) is publishing an Integrated Sustainability Report. This report has been prepared in accordance with the SGX-ST Listing Manual Rule 711(B), Global Reporting Initiative (“GRI”) Standards – “Core”, and GRI’s Construction & Real Estate Sector Supplement (“CRESS”). This report has also embodied elements of the Integrated Reporting Framework of the International Integrated Reporting Council, and Sustainability Development Goals (SDGs) of the United Nations. The report focuses on Ascendas Reit’s core activity as a business space and industrial Real Estate Investment Trust (REIT). 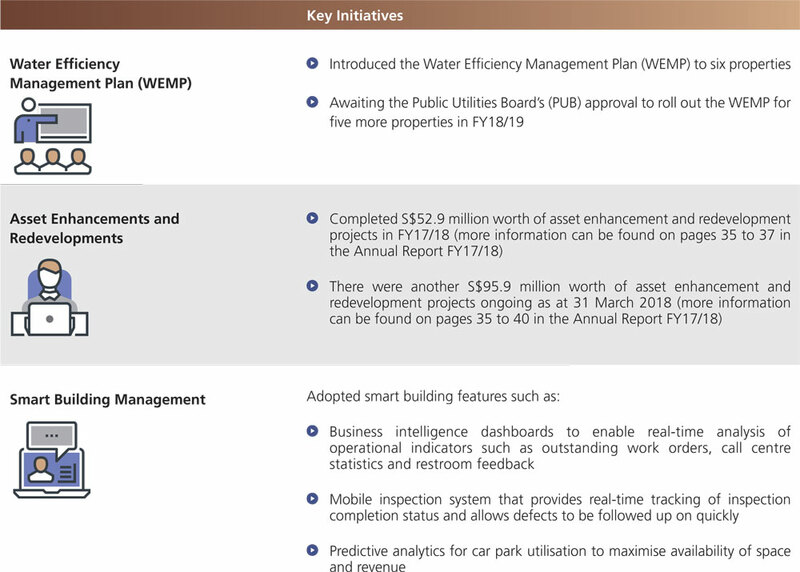 The scope of this report covers its business operations and properties in Singapore and Australia, recording performance from 1 April 2017 to 31 March 2018, with prior year performance included for comparison, where applicable. As at 31 March 2018, Ascendas Reit had a total of 131 properties in a wide range of property segments1, of which 75.3% are multi-tenant and 24.7% are single-tenant. Please refer to pages 54 to 55 of the Annual Report FY17/18 for the full list of Ascendas’s Reit’s properties. Environmental performance of 59 properties have been excluded in this report as Ascendas Reit has taken the operational control approach2 as defined by Greenhouse Gas Protocol Corporate Standard. The Manager has not sought external independent assurance for this reporting period. Feedback on the report can be directed to a-reit@ascendas-singbridge.com. 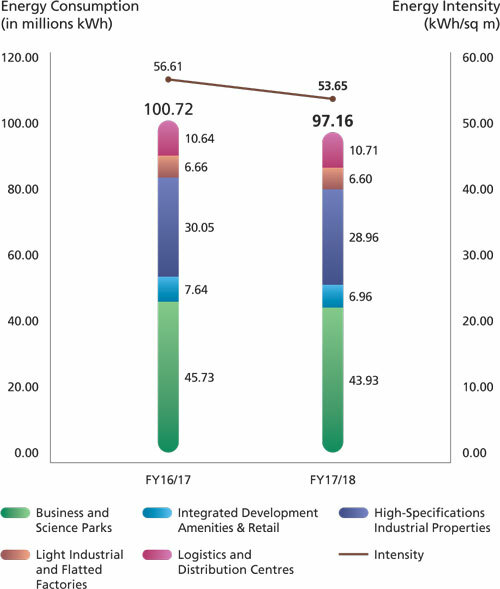 Ascendas Reit's property portfolio includes Business & Science Parks/Suburban Offices, Integrated Development, Amenities & Retail (IDAR) Properties, High-Specifications Industrial Properties and Data Centres, Light Industrial Properties and Flatted Factories, and Logistics & Distribution Centres. As the first and largest listed business space and industrial REIT, Ascendas Reit provides an attractive platform of investment in business and industrial properties in Singapore and Australia. The REIT is managed by Ascendas Funds Management (S) Limited (the Manager), which is a wholly-owned subsidiary of the Ascendas-Singbridge Group (Ascendas-Singbridge). For more details on Ascendas Reit’s Trust structure please refer to page 13 of the Annual Report FY17/18. Across its diverse portfolio, Ascendas Reit had a total customer base of around 1,320 international and local companies as at 31 March 2018. 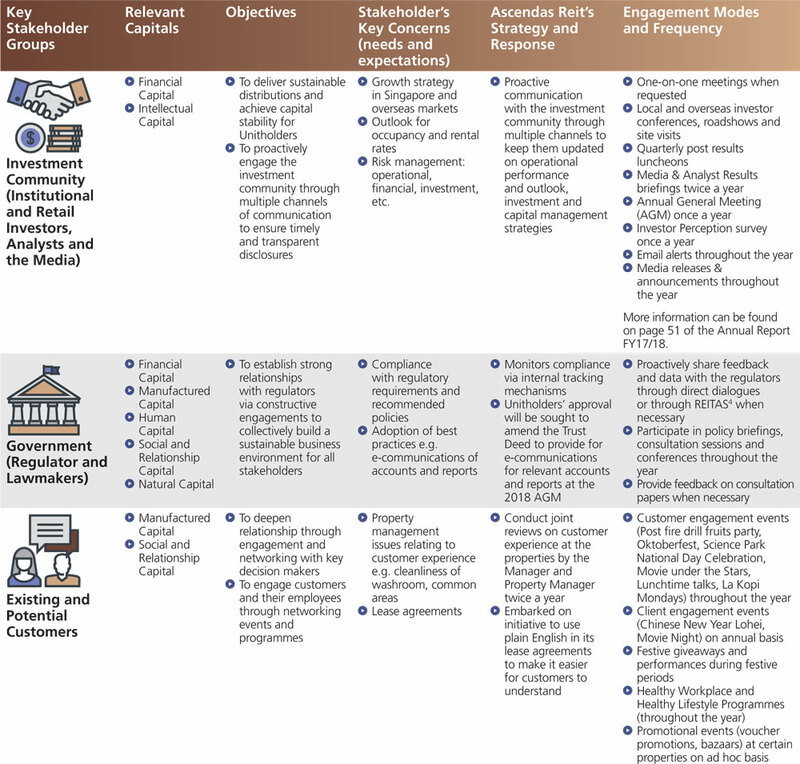 Ascendas Reit’s business model illustrates the importance and relationships around each factor that helps in delivering sustainable value for our stakeholders. Established during the United Nations Conference on Sustainable Development in Rio de Janeiro in 2012, the objective of the SDGs is to meet the urgent environmental, political and economic challenges in our world. With the aim of delivering sustainable value for all Ascendas Reit’s stakeholders, the Manager nurtures quality relationships with its stakeholders by understanding their concerns and being responsive to their expectations. Details are summarised in Table 1. 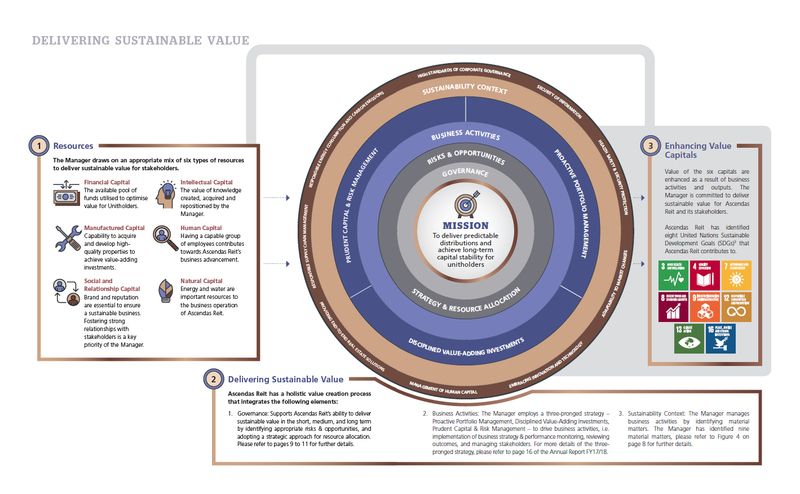 Governance and culture sets the foundation for delivering sustainable value. Robust governance provides trust and confidence to the stakeholders; culture unites the employees; and corporate values guide the employees in making right business decisions. The “Power of One” – Passion, Open, Win, Excel, Respect, One Team – best illustrates Ascendas Reit’s culture. This culture aims to empower every employee to contribute, learn and have fun while at work. 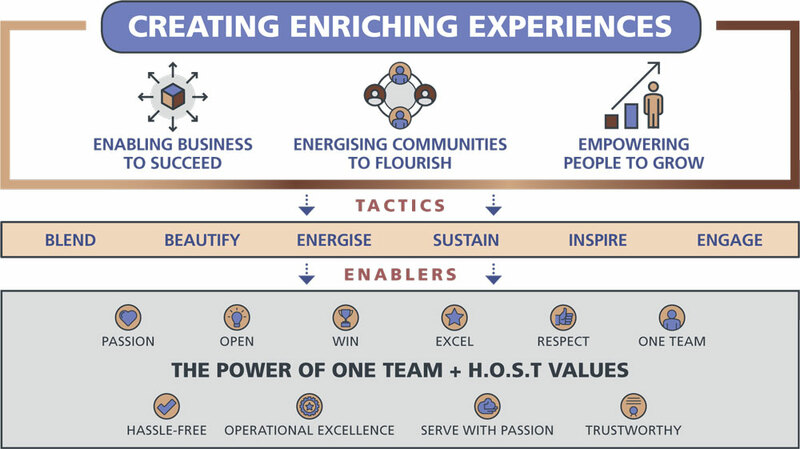 Along with the H.O.S.T service values -- Hassle-free, Operational Excellence, Serve with Passion, Trustworthy – the “Power of One” culture connects people and ideas to opportunities, enrich experiences, and ultimately delivers value for businesses, communities and people. In FY17/18, sustainability risk has been identified, and defined as risk arising out of uncertainties in the long-term continuity of the business due to significant negative impact from EESG factors. During the financial year, there were three incidences of noncompliance due to late notifications of licensed representative’s change in personal details to the Monetary Authority of Singapore (MAS). The Manager will continue to improve its efforts to ensure regulatory compliance. There were no other reported cases of non-compliance to laws and regulations such as SGX-ST Listing Rules, the Code of Collective Investment Schemes issued by the MAS and tax rulings issued by the relevant local tax authorities. The Manager is expected to report to Audit Committee (AC), Operational Risk Management Committee (ORMC) and Board on any material EESG findings and make recommendations to mitigate or manage such risks. Since FY12/13, the Manager has taken proactive actions in disclosing the EESG factors and performance by publishing its Sustainability Report annually. 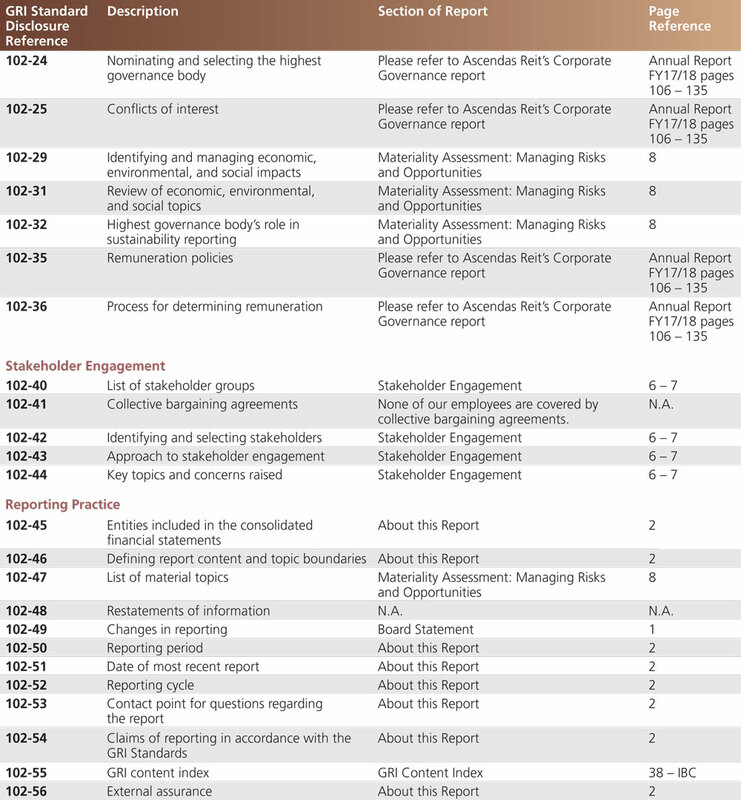 For further details of the risk management process, please refer to pages 118 to 122 of the Corporate Governance Report in the Annual Report FY17/18. The Manager is committed to upholding the highest standards of governance. Policies and practices, as shown below, are communicated to all new and existing employees through mandatory induction programmes and refresher trainings. A guide that outlines specific conduct requirements of the employees in the exercise of any power in the performance of any duty or function. Employees shall not engage in activities that directly or indirectly abuse one’s official position to achieve personal interests. A channel for employees and external parties to highlight any misdeeds or improprieties committed by employees to the AC (details are available on the Ascendas Reit’s website). A guide for employees who aim to hold external directorship appointments in their personal capacity in any company in which Ascendas-Singbridge has no direct interest in. Guidelines and procedures for handling misconduct and to ensure that the inquiry and disciplinary processes are fair, objective and equitable. Guidelines for employees who aim to hold external employment in a company outside of Ascendas-Singbridge. Guidelines on solicitation, acceptance and acknowledgement of gifts by employees, and gifts given to and/or received from business partners. ‘Know your customer’ due diligence checks are carried out for Ascendas Reit’s property management transactions. Guidelines on the hiring, placement and transfer of relatives of current employees. 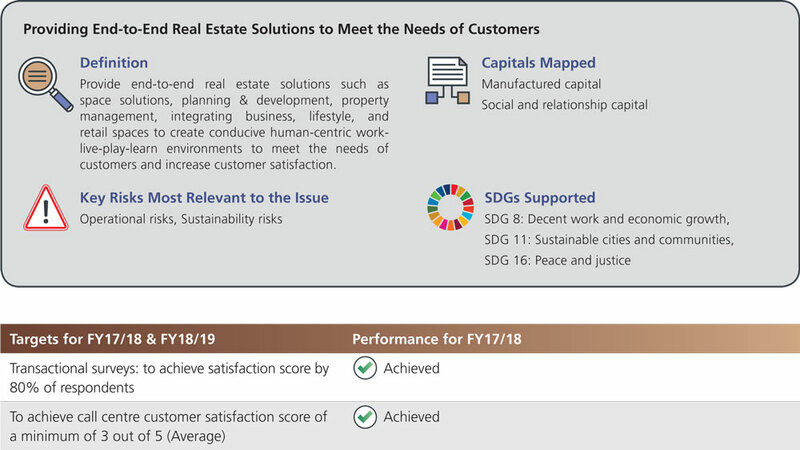 Ascendas Reit is committed to ensuring that the organisation is effective, accountable, and transparent at all levels, aligning itself to SDG 16 (Justice and peace). More details on the policies and practices can be found from pages 106 to 129 of the Corporate Governance Report in the Annual Report FY17/18, which was published with reference to principles of the Code of Corporate Governance 2012. Ascendas Reit’s financial capital are the diversified sources of funds that are managed prudently to deliver sustainable value for Unitholders. For more information on the financial performance and management of financial capital of Ascendas Reit, please refer to page 34 and page 42 of the Annual Report FY17/18. Ascendas Reit’s manufactured capital is its ability to attain value-adding investments through the acquisition and development of high-quality properties. For further details on acquisitions and developments, please refer to pages 34 to 38 of Ascendas Reit’s Annual Report FY17/18. 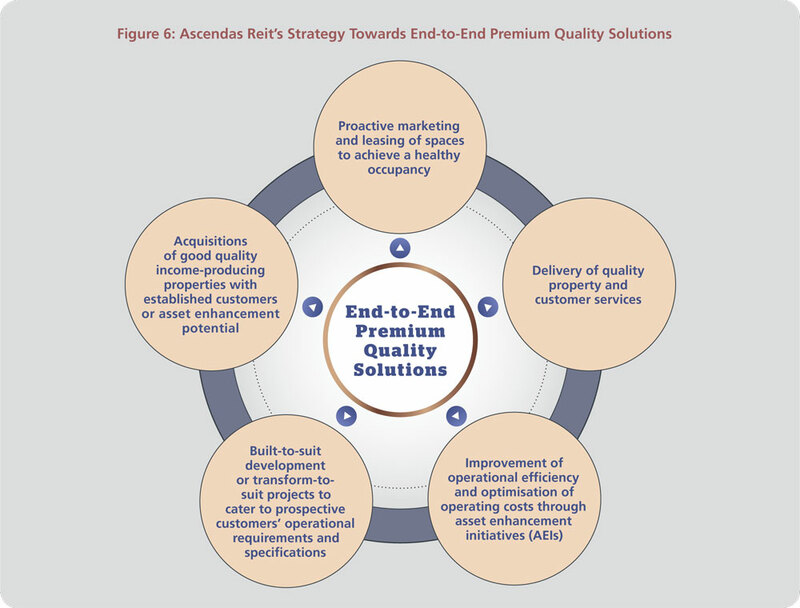 Ascendas Reit strives to deliver value to all its customers by offering premium end-to-end quality solutions. The strategies to achieving this, together with the Property Manager, is showcased in Figure 6. Various initiatives were introduced by the Manager to uphold the quality of its assets. 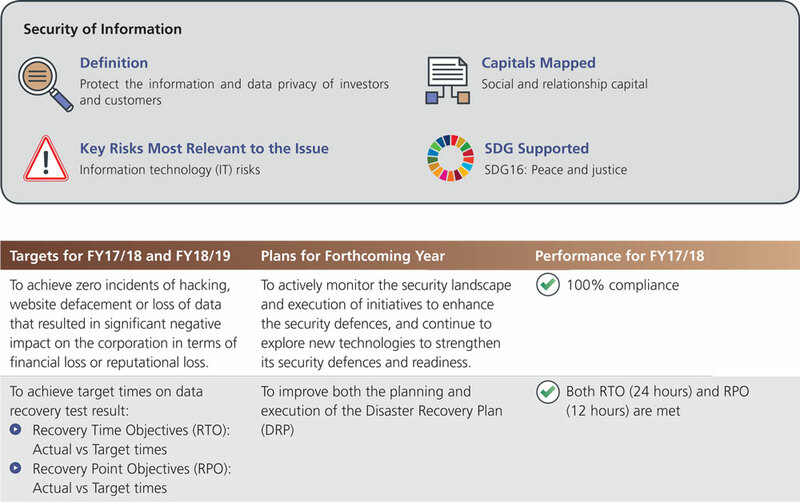 Some of the key initiatives are shown in Table 2. By introducing initiatives and improving the quality of its assets, Ascendas Reit seeks to meet the evolving needs and expectations of its customers. For more details on ‘Providing End-to-End Real Estate Solutions to Meet the Needs of Customers’ as well as the Manager’s targets on customer satisfaction, please refer to the Customer Satisfaction section on page 23. With the increasing scrutiny faced by organisations, and with investors and consumers shaping the corporate agenda, it is important for organisations to practice responsible procurement. Ascendas Reit highly regards the principles of good governance and business integrity, and seeks to ensure that the suppliers engaged are aligned to Ascendas Reit’s practices in this regard. The Manager has a four-stage procurement system: prequalification, tender, execution, and review. During the prequalification process, the Manager conducts due diligence on the sustainability policies and certifications of new suppliers. All suppliers are expected to comply with applicable laws and regulations including environmental and safety requirements. Ascendas-Singbridge conducts periodic assessment in the execution and review stage to evaluate the work delivered and safety practices established by the vendors. Controlled self-assessments are conducted annually to monitor the effectiveness of the procurement process, and improvement areas are identified. In FY17/18, 96 out of 188 suppliers were screened using the environmental criteria, as compared to 78 suppliers in FY16/17. As at 31 March 2018, 72% of the active suppliers are based in Singapore and 28% in Australia. To be better equipped for vendor management, relevant training courses are identified and rolled out for employees, for instance, e-learning courses on AML and anti-bribery. All employees are expected to adhere to the AML policy. Ascendas Reit seeks to align its operations to SDG 16 (Justice and peace) by ensuring compliance to applicable requirements. On 24 August 2017, SCDF announced that 40 buildings in Singapore could have potentially used non-Class ‘0’ composite panels as cladding on their external walls. This might not adhere to the Fire Code, which requires composite panels used as cladding to be either non-combustible or certified as Class ‘0’. One of the affected buildings mentioned was Ascendas Reit’s property – 1 Changi South Lane. The affected panels made up less than 10% of the total external façade at 1 Changi South Lane. All of the affected panels were removed and replaced with approved panels. Social & Relationship Capital refers to the relationships within and between communities, groups of stakeholders and other networks. Ascendas Reit strives to enhance individual and collective well-being, strengthening Ascendas Reit’s brand and reputation. As a business space provider, Ascendas Reit is committed to providing its employees, workers, customers and visitors with a safe and secure environment. In order to do so, Ascendas Reit adopts a multi-faceted approach to safeguard the health, safety and security of all stakeholders. Figure 7 elaborates on this strategy. Ascendas-Singbridge has established a Workplace Safety and Health (WSH) policy. Through this policy, the Manager seeks to promote a safety culture that has zero tolerance towards workplace injuries. This is done by ensuring compliance with all applicable Workplace Safety and Health laws and regulations, improving its systems and practices through regular training on workplace safety and health issues, encouraging safe work practices, building a positive mindset and culture towards safety, and adopting industry best practices. Table 3 elaborates on some of the practices that Ascendas Reit adopts to manage health, safety and security protection of its stakeholders. This target is applicable only to Singapore properties. The rates are defined by the Ministry of Manpower (http://www.mom.gov.sg/workplace-safety-and-health/wsh-reports-and-statistics). The targets were benchmarked against the latest available national statistics at the start of the financial year. In FY17/18, there were 17 incidents recorded. Nine incidents were due to slips and falls, four were caused by accidently getting struck by objects, three incidents were due to minor cuts, and one incident was due to a strained back while performing some housekeeping tasks. To prevent reoccurrences, the Property Manager took immediate actions such as installing signages, installing anti-slip strips, increasing the frequency of spot cleaning and sending reminders to employees, cleaning vendors, customers and workers. In FY17/18, Ascendas Reit’s fatality injury rate, accident severity rate and accident frequency 7 Source: Ministry of Manpower rate was 0, 64 and 0.81 respectively. These rates were below the national average of 1.9 for fatality injury rate, 86 for accident severity rate and 1.6 for accident frequency rate7. The health and well-being of employees contribute towards a motivated and productive workforce. The Manager continues to look into ways to improve its employees’ health and overall wellness. 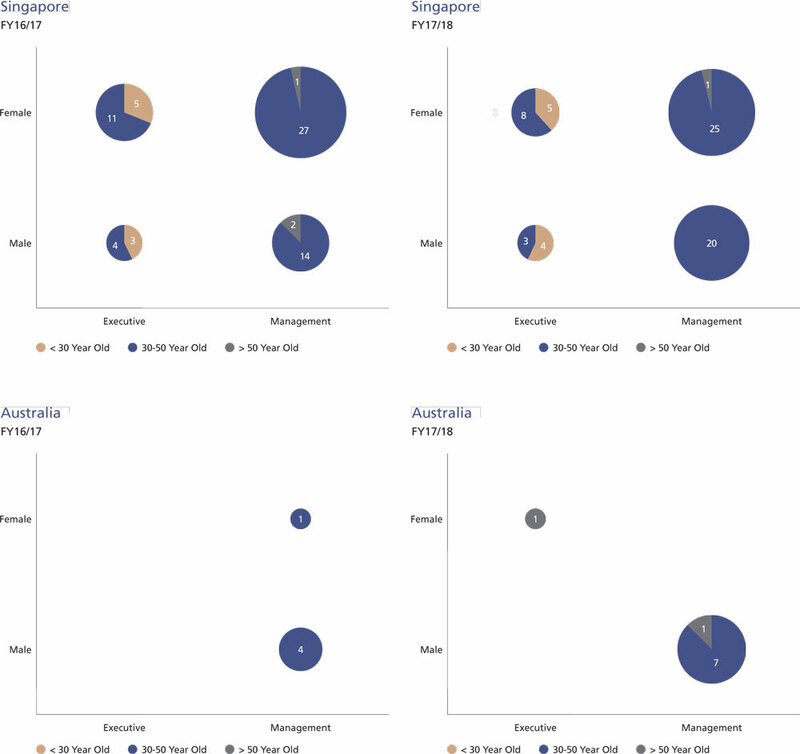 In FY17/18, the Manager recorded an improvement in absentee rates amongst its Singapore employees but observed a slight increase in absentee rates amongst its Australia employees. Ascendas Reit seeks to contribute to SDG 3 (Good health) by providing safe spaces for its employees, customers, vendors and visitors, and to SDG 16 (Justice and peace) by taking proactive steps to prevent any forms of unlawful behaviour or incidents at its properties. Customer privacy and data security are vital to the sustainability of Ascendas Reit’s business given the increasing occurrence of unwarranted data mining. Without proper surveillance of data, Ascendas Reit may incur avoidable reputational and financial damages. To prevent any breaches of security of information, compliance with various regulations such as Personal Data Protection Act (PDPA), and MAS Technology Risk Management Guidelines (MAS TRMG) are strictly adhered to. In addition, Ascendas-Singbridge has established an Information Technology (IT) Policy and Enterprise Mobility Policy. Employees of Ascendas-Singbridge’s IT department undergo regular training and skills upgrading. Premier support services from external information security suppliers are engaged to provide frequent security updates. Internal audits are conducted on the financial system and real estate management system to ensure adherence to the MASTRMG guidelines. Every month, an assessment on the security alert level of Ascendas-Singbridge is conducted based on these six aspects: Governance, Network, Devices (Server, Endpoint and Mobile), Application, Data and User. In the reporting period, Ascendas Reit’s overall security alert level has been low, indicating that adequate measures are in place. Ascendas-Singbridge has an Information Security Council whose primary roles are to plan, manage, support and ensure management commitment in all information security activities. Under the stewardship of the Information Security Council, there were zero cases of substantiated complaints from outside parties or regulatory bodies as well as zero cases of identified leaks, thefts and losses of customer data. Customer satisfaction plays a pivotal role in Ascendas Reit’s business. The Manager believes in fostering strong relationships with all its customers and providing them with a unique Ascendas Reit experience. To ensure that end-to-end real estate solutions are catered to meet the needs of customers, policies covering customer care programme, customer service empowerment, customer delight and customer recovery have been established. Resources are channelled to monitor and manage customer satisfaction. New technologies have been deployed, such as digitisation of building review feedback and the roll out of a new mobile application, asap – The Ascendas-Singbridge mobile application. This application is a digital platform to engage our customers, their employees and visitors to our properties. It includes features such as car park availability at Targets for FY17/18 & FY18/19 Performance for FY17/18 Transactional surveys: to achieve satisfaction score by 80% of respondents Achieved To achieve call centre customer satisfaction score of a minimum of 3 out of 5 (Average) Achieved our properties, shuttle bus tracking and a feedback feature called ‘Fix-it’ which provides another avenue for users to report property management related issues. In addition to the asap mobile application, other feedback mechanisms in place are customer hotlines and surveys. In the reporting year, all feedback received were responded to and successfully resolved. In order to embed the H.O.S.T service culture deeper within the organisation and drive greater consistency in service delivery, H.O.S.T. training was extended to support staff of the Manager and Property Manager as well as outsourced service providers including cleaners and security guards. A workshop for middle management guided them on how to enhance the ownership and consistency of their team’s performance. In addition, H.O.S.T induction events are held every quarter for new staff. Intellectual capital refers to the value of knowledge created, acquired and repositioned for application by the organisation. This capital is core to the Manager’s strategy formulation and knowledge management, which will contribute towards the sustainable growth of Ascendas Reit. Ascendas Reit strives to achieve predictable distributions and long-term capital stability for Unitholders. With evolving market conditions, it is necessary for the Manager to keep abreast of the industry market trends to stay competitive, seize growth opportunities, and mitigate risks that may impact Ascendas Reit’s business operations. The Manager recognises the importance of managing the relevant risks, and policies and practices have been put in place to mitigate these risks. The controls include periodic macro market studies, monitoring of industrial and office vacancy, capital value movement, leading economic indicators (such as gross domestic product, consumer price indices, non-oil domestic exports), and monitoring of political and social developments. The Manager reviews its strategies to respond to the market changes. 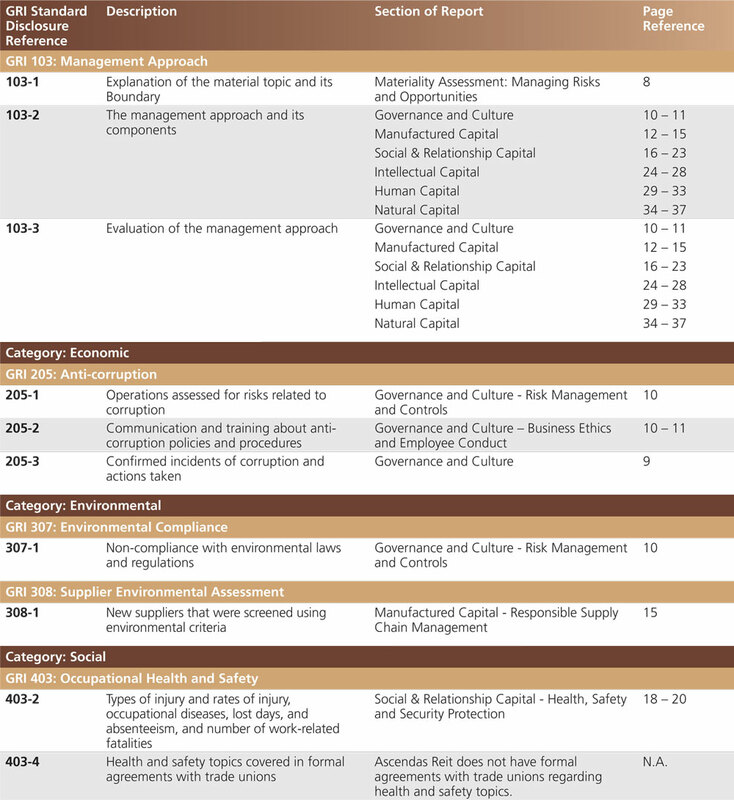 Notably, this is the first year that the Manager has identified sustainability risks in its ERM. This initiative will help the Manager to integrate sustainability across its business processes. Ascendas Reit also engages third-party consultants to conduct independent studies on the industrial property markets that it operates in to identify potential impacts to its business. For more information, please refer to pages 80 to 103 of the Annual Report FY17/18. The Manager strives to comply with all the laws and regulations and keep abreast with the evolving regulatory landscape in the countries it operates in. No breaches were identified during Ascendas Reit’s periodic internal and external compliance audits, including compliance audit by MAS for Ascendas Reit’s Singapore operations. An example of Ascendas Reit’s commitment to be in compliance with all applicable regulatory equirements is its compliance with JTC Corporation’s subletting regulations that requires property owners to lease not more than 30% of a building’s gross floor area (GFA) to non-anchor tenants, amongst other criteria. Despite Ascendas Reit’s large portfolio, the Manager was able to comply with the rule by proactively managing the customer composition in its properties. In the current environment, adopting innovation and technology is critical for the long term growth and success of any organisation. Numerous industries are encountering challenges that result from the advancement of technology and the real estate industry is no exception. Ascendas Reit actively embraces innovation and technology to deliver holistic real estate solutions and position its portfolio for future demand. The Manager is cognizant of the need to innovate constantly in order to maintain its competitive edge. 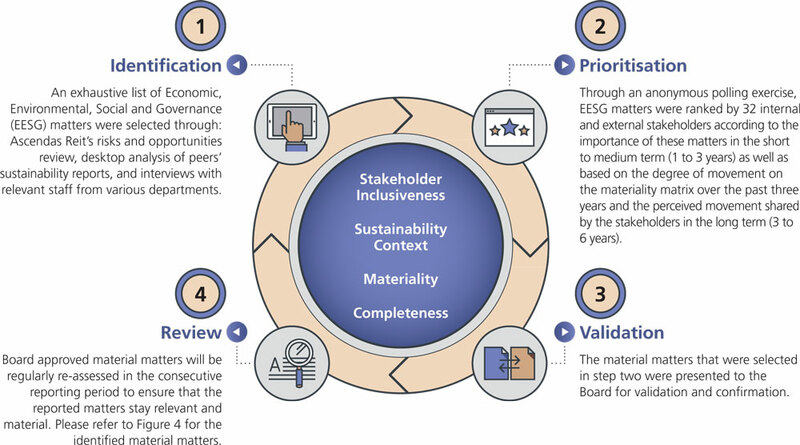 An Innovation Framework, consisting five phases as shown below in Figure 12, was established. 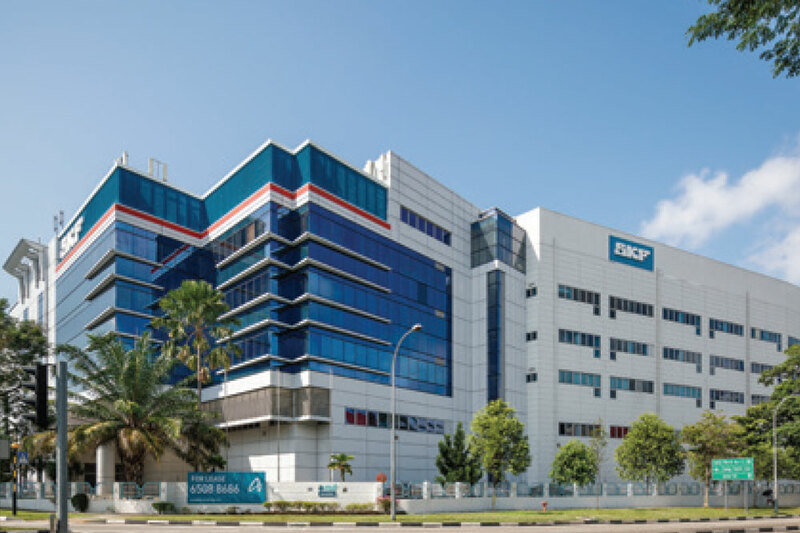 During the year, the AOC was launched and deployed at Ascendas Reit’s Singapore Science Park properties as well as Aperia. The AOC leverages technology to gather data from various buildings to achieve more efficient building performance and enhance customer experience. For example, real-time data can be monitored centrally and shared with the asset management team and call centres. This enables the Manager to optimise energy usage at its properties, improve response time to incidents, detect faults and reduce equipment downtime as well as improve security surveillance. The CoSpace Park (cospacepark.com) is a 24/7 co-working space located at Singapore Science Park 2 and is a collaboration between Ascendas-Singbridge and TNB Ventures (a venture capital firm and incubator). The space provides a customer centric, community-focused environment for businesses predominantly in R&D and technology. 'Park of the Future' programme - start-ups received a suite of resources including mentorships to support their pilot projects and have the opportunity to test their solutions in buildings and infrastructures within the park. 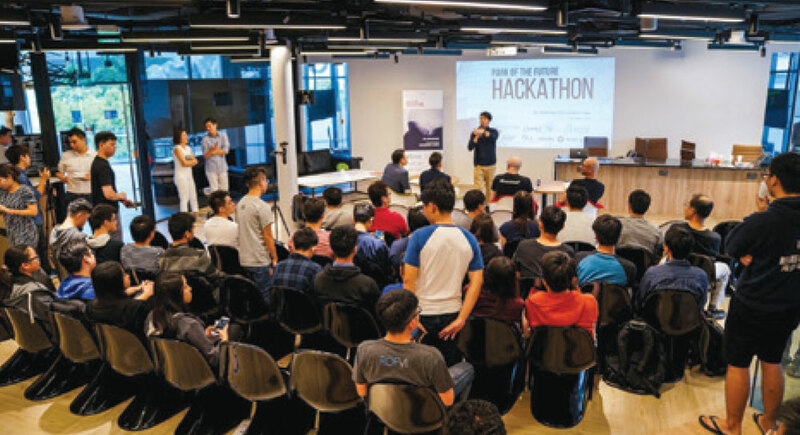 ‘Hump Day Hacks’ – A series of short, casual lunch sessions where the Manager invites start-ups to share about technology hacks that the participants can apply in life (e.g. Food hacks, travel hacks, logistics hacks etc.). The Workshop (www.theworkshop.sg) is a collaborative workplace located in Techplace II that aims to benefit Small Medium Enterprises (SMEs), start-ups and industrialists in a refined industrial space. To keep up with the request for generic information such as price plans, location and address, amenities and photos during peak periods or after office hours, an AI Customer Service FAQ Chat bot was created. This initiative has improved customer service and allows the sale staff to have more time to focus on higher value-added tasks. Instead of issuing keys and radio-frequency identification (RFID) cards every time a new customer comes on-board, a fully digitised access control system has been introduced to automate the process including reservations for amenities via a mobile application. This initiative provides greater convenience and eliminates the need to print and programme RFID cards. The Manager believes that human capital is the most valuable asset as motivated and competent people are key drivers in delivering sustained value. Ascendas Reit’s culture of “Power of One” empowers every employee to connect people and ideas to opportunities that enrich their personal experiences and delivers value for businesses, communities and people. Creating a workplace environment that treats every employee with equality regardless of ethnicity and gender is fundamental to the “Power of One” culture. The Manager commits to the 5 Principles of Fair Employment Practices under the Tripartite Alliance for Fair Employment Practices (“TAFEP”) (Please refer to Figure 13 for further details), and instils the principles in its policies and practices. The Manager also commits to creating a workplace environment that enables its employees to flourish. 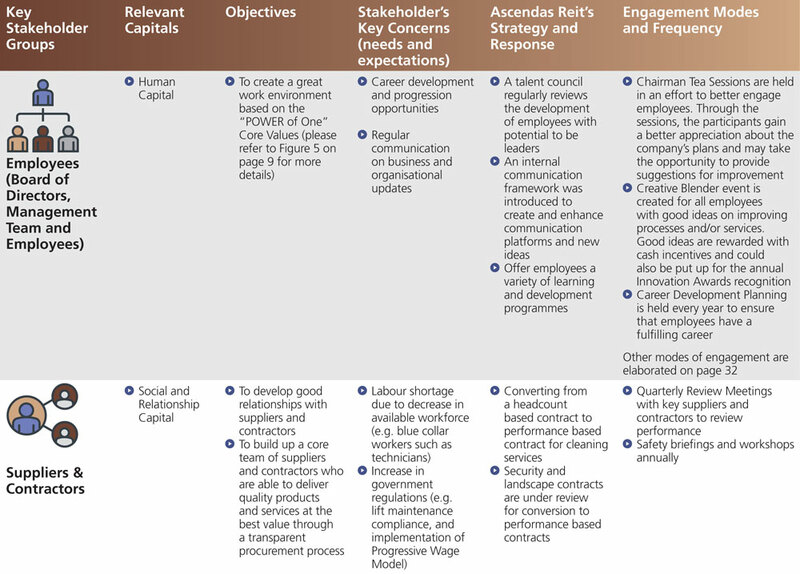 This commitment is demonstrated through its employee engagement programmes (as detailed in Table 5 on page 32). In FY17/18, flexible work arrangements were introduced to support work-life integration and promote a pro-family culture, This includes “staggered work hours” and “work from home” arrangements. There is a conscious effort to strengthen the talent pipeline at different levels. With the implementation of Ascendas-Singbridge Management Associate Programme (“a-map”) young university graduates with leadership potential are recruited and provided with mentoring and exposure to various departments over an 18-month programme to establish strong foundations of the business knowledge and skills. As at 31 March 2018, the Manager has a total staff strength of 75 full time permanent employees – 66 in Singapore and 9 in Australia – of which 53% are female employees. This signifies the Manager’s efforts in achieving fair employment practice and gender diversity. Furthermore, the Manager has two female directors in its Board of Directors. Turnover rate in FY17/18 was 12.0%, lower than 15.3% in FY16/17. Encourage employees and managers to jointly focus on requirements of the job, understand accountabilities, and develop meaningful standards and attainable goals. There was a slight decrease in the total staff training hours in FY17/18 (28 hours per employee per annum vs 30 hours per employee per annum in FY16/17). This was mainly due to the significant investments in Corporate Programmes – Power of One Learning Carnival and H.O.S.T Training in FY16/17. In July 2017, Ascendas Reit participated in OurVoice@asb 2017, a biennial employee engagement survey. The survey is based on 12 focus areas: Senior Leadership, Supervision, Career Development, Performance Management, Rewards and Recognition, Work Tasks, Empowerment, Communication and Collaboration, Vision, Enabling Infrastructure, Brand and Customer Focus. After reviewing the results, a Group-Wide Action plan was formed to implement the internal communication framework to enhance employee engagement and communication. This framework comprises key priority areas such as leadership connectivity and inter-departmental connectivity. By upholding labour rights, promoting an engaging workplace environment and providing learning and development opportunities, Ascendas Reit contributes to SDG 4 (Quality education) and SDG 8 (Decent work and economic growth). Natural Capital refers to the natural resources such as energy and water, which are essential in supporting the business operations. In response to the Paris Agreement8, the governments of Singapore and Australia have set targets to reduce emissions by 36% and 26-28% on 2005 levels by 2030 respectively. Ascendas Reit recognises the impact of energy consumption and its carbon footprint on both the company’s operations and the environment it operates in. The Manager remains committed to aligning its goal of optimising energy usage and reducing emissions with the national and international goals. Ascendas-Singbridge has formalised a target of having 20% of its energy consumption to be from renewable sources by 2025. The Paris Agreement’s central aim is to strengthen the global response to the threat of climate change by keeping a global temperature rise this century well below 2 degrees Celsius above pre-industrial levels and to pursue efforts to limit the temperature increase even further to 1.5 degrees Celsius. As of March 2018, a total of 175 countries have ratified to the Paris Agreement. As at 31 March 2018, about 60.6% of Ascendas Reit’s portfolio was directly under the operational control of the Property Managers, in terms of Gross Floor Area (GFA). During the reporting year, energy efficient air conditioning systems and LED lightings were introduced to facilitate the reduction in energy consumption. These initiatives contributed to a drop in total electricity consumption in the Singapore operations from 101.99 million kWh in FY16/17 to 97.75 million kWh in FY17/18, and in energy intensity from 55.44 kWh/sq m in FY16/17 to 52.70 kWh/sq m in FY17/18. Correspondingly, carbon emissions and carbon emissions intensity decreased by 4.16% and 4.95% respectively. The 4.24 million kWh reduction achieved by Ascendas Reit is equivalent to monthly electricity consumption of approximately 11,5849 four-room HDBs in Singapore. The Manager also tracked the like-for-like energy performance of its portfolio by using comparable data (i.e. using the same set of properties). The Manager has achieved a reduction of 3.56 million kWh in Ascendas Reit’s Singapore operations considering like-for-like comparison, from 100.72 million kWh in FY16/17 to 97.16 million kWh in FY17/18, translating to a reduction of 1.5 kilotonnes of carbon emissions. Please refer to Figures 17 and 18 for more details on like-for-like comparison of energy consumption and carbon emission, respectively. This has been calculated using the national average household electricity consumption of a four-room HDB in Singapore. This national average figure is sourced from SP Group considering latest data available for the period of March 2017 to February 2018. 10 For the purposes of calculating energy and carbon intensities, the energy consumption and carbon emissions for the common areas (chillers, corridors, perimeter lightings and centralised building facilities under Ascendas Reit’s direct control) are included in the numerator while the effective Gross Floor Area (GFA) is used as the denominator. Effective GFA is calculated considering total GFA and occupancy rate. 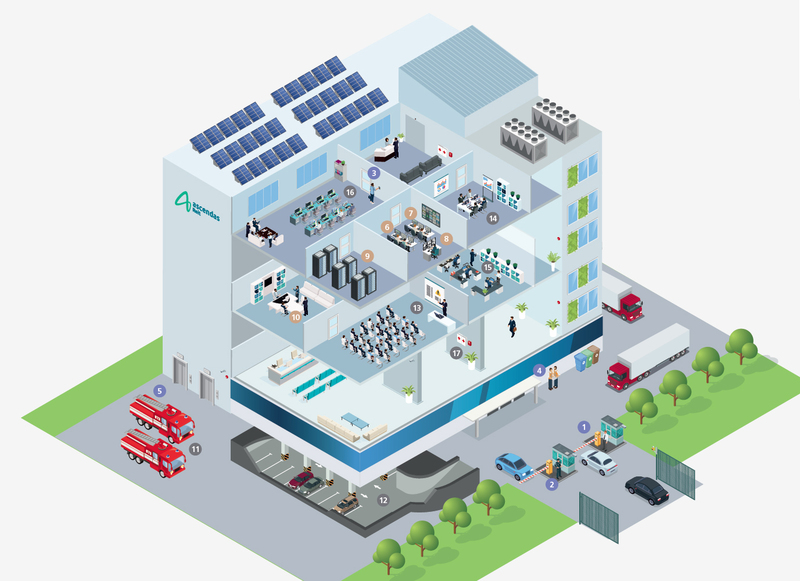 Effective GFA is introduced as a large proportion of energy consumed are attributed to shared services such as the building’s chiller system. 11 Emission factors used are taken from the 2017 Singapore Energy Statistics published by the Energy Market Authority of Singapore. 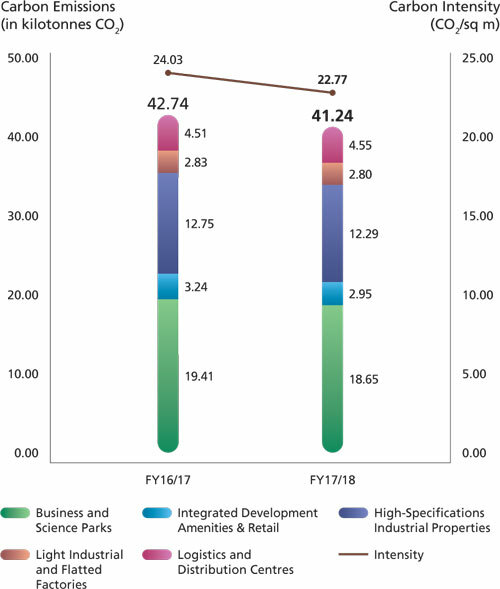 There is negligible Scope 1 emissions for Ascendas Reit’s properties in Singapore, which is mainly from back-up diesel powered generators that were not called in service during FY17/18 except for routine maintenance purposes. For the Ascendas Reit properties in Australia, there was an increase in energy consumption and intensity, which is attributed to the acquisition of buildings at 100 Wickham Street and 108 Wickham Street in September 2017 and December 2017, respectively. Electricity consumption in the Australian operations rose from 1.04 million kWh in FY16/17 to 8.29 million kWh in FY17/18, and likewise the energy intensity from 46.77 kWh/sq m in FY16/17 to 174.98 kWh/sq m in FY17/18. Correspondingly, carbon emissions increased from 867 tonnes9 in FY16/17 to 6,881 tonnes in FY17/18, and carbon emissions intensity went up from 38.82 CO2/sq m in FY16/17 to 145.23 CO2/sq m in FY17/18. Water stress continues to be a national challenge for both Singapore and Australia as water scarcity is expected to intensify as a result of the increasing demand and limited supply of water. Though water consumption is not one of the material matters, the Manager does monitor its water consumption and actively identifies opportunities to improve water efficiency. As a result of the Managers’ sustainability practices to encourage water conservation, total water consumption in Singapore operations fell from 1,321.8 thousand m3 in FY16/17 to 1,224.0 thousand m3 in FY17/18, and water intensity dropped from 0.72m3/sq m in FY16/17 to 0.66m3/sq m to FY17/18. The Manager has achieved a reduction of 88.6 thousand m3 considering like-forlike water consumption in Ascendas Reit’s Singapore properties, from 1,300.3 thousand m3 in FY16/17 to 1,211.7 thousand m3 in FY17/18. 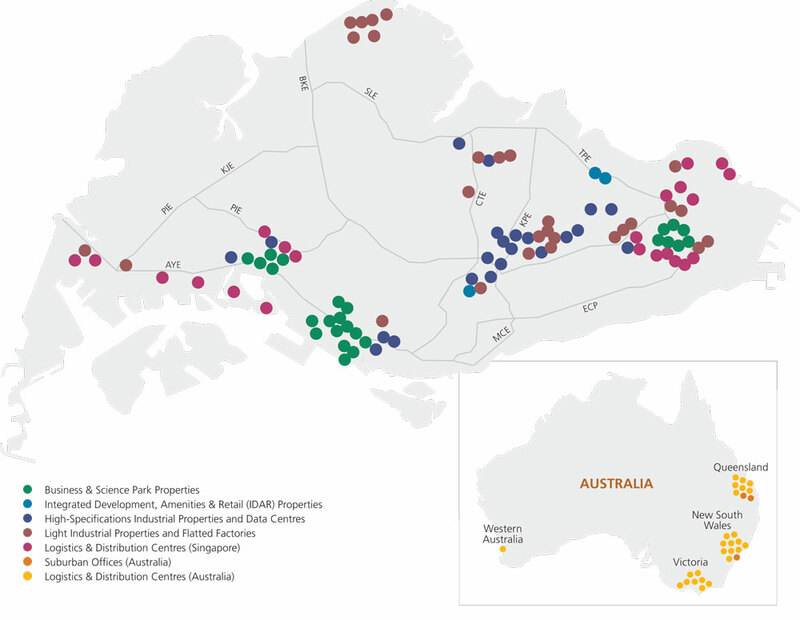 Owing to new acquisitions in Australia, total water consumption rose from 14.7 thousand m3 to 52.0 thousand m3 and water intensity increased from 0.66 m3/sq m to 1.10 m3/sq m.
NEXUS @one-north is a business park property developed by Ascendas Reit. It is located within one-north, a park designed to host a cluster of world-class research facilities and business park space, all built to support the growth of Biomedical Sciences, Infocomm Technology (ICT), Media, Physical Sciences and Engineering. With a site boundary of 6,252 sq m and a total built-up area of 25,511 sq m, the development comprises of two 6-storey tower blocks, designed in a curved body form, in response to the local context and business objectives. The green features of NEXUS @one-north include optimised façade designs, energy efficient air-conditioning system, automatic demand controls to regulate lightings, fresh air, carbon monoxide levels in carpark areas and water usage. Solar photovoltaics (PV) provide energy to the building during daytime. Water conservation initiatives, such as harvesting rainwater for irrigation of sky gardens and landscape as well as water efficient fittings, are also integrated into the building. The property was the top winner at the ASEAN Energy Awards 2017 for the Green Building (Large) category. 2.5% of the annual total building consumption generated by solar PV and its chiller plant system operates at a high efficiency of 0.579kW/RT, with controls optimised through the use of variable speed drives for the pumps and cooling towers.